I've mentioned before in this blog that one of my favorite recipes I've found online is the Pioneer Woman's recipe for Texas Chocolate Sheet Cake. I hadn't dared attempt to adapt it for high-altitude, but this weekend, I had a massive craving for chocolate sheet cake that I couldn't ignore. So I rolled up my sleeves and decided to give this a go -- to great success! Very cute, right? I was charmed. So, without further ado, here is the Pioneer Woman's recipe for Texas Chocolate Sheet Cake... adapted for high-altitude! The original, sea-level recipe can be found here. Position the oven rack that you will be placing your jelly roll pan on to the second to highest level in the oven; that is, it should be one rack-level away from the top of the oven. Preheat the oven to 350 degrees (F). In a large mixing bowl, combine flour, sugar, and salt. Set aside. Melt 2 sticks regular (NOT UNSALTED) butter in a medium saucepan. While the butter is melting, boil 1 cup of water in a small pot. Set aside. When the butter has melted, add 4 heaping, unleveled tablespoons of cocoa powder to the butter mixture. Mix thoroughly. Keep the heat on (but make sure the butter mixture does not begin to bubble), pour in the boiling water. Allow the resulting mixture to bubble for 30 seconds, before turning off the heat and setting aside. Pour this chocolate-butter mixture into your large mixing bowl containing your flour mixture (from step 1), and stir lightly just enough to cool the chocolate. In a measuring cup, pour 1/2 cup buttermilk. Add 2 beaten eggs to the buttermilk in the measuring cup. Add 1 teaspoon vanilla to the buttermilk-egg mixture in the measuring cup. Add 1/2 teaspoon of baking soda to the buttermilk-egg mixture, and stir. Pour the buttermilk-egg mixture into your large mixing bowl containing the flour and chocolate mixture. Stir together well until a smooth, consistent batter is achieved. Pour the batter into a slightly greased 17.25 x 11.5 inch jelly roll pan, using a rubber spatula to spread evenly throughout the pan. Place the jelly roll pan into the oven rack that you positioned in the first step, allowing it to bake at 350 degrees (F) for 20 minutes. Prepare the chocolate frosting while the cake is baking in the oven. Once the cake has finished baking in the oven, let cool slightly on a cooling rack before pouring the chocolate frosting on the still-warm cake. In a large saucepan, melt 1 plus 3/4 sticks of regular, unsalted butter. Once the butter is melted, add 4 heaping, unleveled tablespoons of unsweetened cocoa powder. Stir together, and allow the butter-chocolate mixture to bubble for 30 seconds. Turn off the heat. Add 6 tablespoons of whole milk and 1 teaspoon of vanilla to the butter-chocolate mixture. Add all the powdered sugar in one go, stirring together until the mixture is smooth and creamy. Pour the still-warm frosting over the still-warm chocolate cake, making sure not to pour too much (or the frosting will overflow out of the jelly roll pan). Try to pour all over the cake's surface, or use a spatula to spread out the frosting consistently. Allow to cool completely. Once the cake has cooled, cover with saran-wrap and let chill in the refrigerator for 3-4 hours. Once the cake has chilled, take out from the refrigerator. 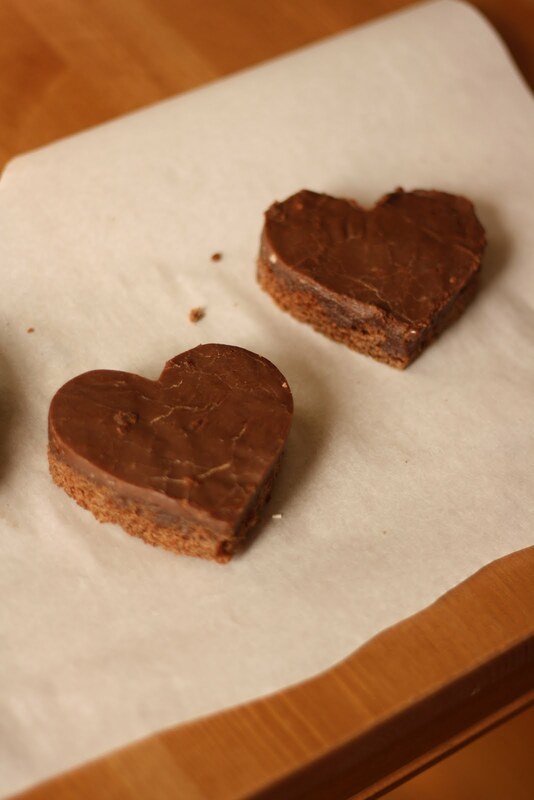 Use your heart-shaped cookie cutter to cut as many hearts into the cake as you can. 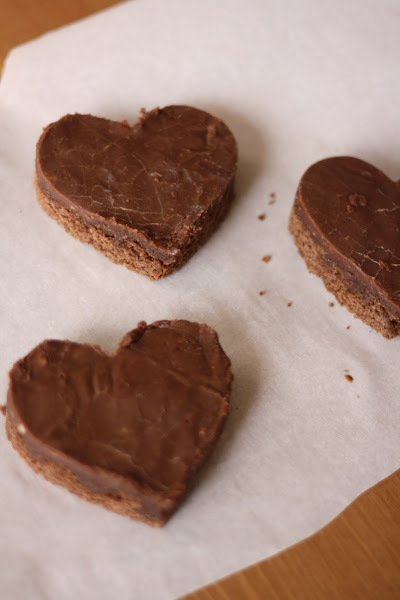 The best way to do this is to start from the edges of the pan, alternating between one regular heart (with the narrowest tip of the heart towards you) with one upside-down heart (with the tip away from you). Do not substitute the unsweetened cocoa powder for sweetened cocoa powder; doing so will make the chocolate flavor of the cake less intense. The original recipe for the frosting included 1/2 cup finely chopped pecans; feel free to add this or any other nut you want into the frosting. Add these nuts after you have added powdered sugar into the chocolate-butter mixture. All spoon measurements are level and unsifted, unless otherwise specified (the cocoa powder, for instance, is not leveled). To level the ingredients, take the back of a knife and run it across the top of the measuring cup until the excess ingredients are scraped off. Liquid and dry measuring cups are different; please make sure you use the measuring cup appropriate for each ingredient. After adding the chocolate-butter mixture to the flour mixture, do not overbeat the resulting mixture as this will overwork the flour and make the cake dense. Simply beat or stir until the chocolate-butter is just incorporated. Do not open your oven until the minimum time recommended has passed. Too much cold air coming from a frequently opened oven door causes irregular oven temperatures that affect the baking process. Make sure that both your frosting and the cake is still warm when you pour the frosting over the cake. The warmth of the cake should help you spread the thick frosting, creating a smooth layer that is hard to achieve with a spatula. If you're having a hard time cutting the cake with your cookie cutter, use a dull knife to aid in the process. 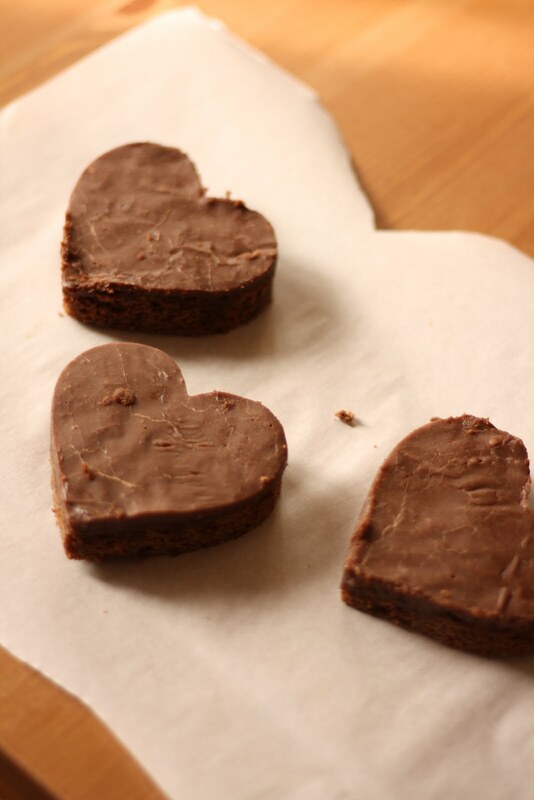 Cut OUTSIDE the cake, and gently pull the heart shaped portion away from the rest of the sheet cake. Use your thumb to gently jimmy the cake out. You're going to have a lot of leftover scraps of cake. I took these scraps and put them in a tupperware away in my freezer; use these scraps for future projects like cake pops or add-ins to ice cream. so yummy looking..perfect for giveaways for any occasion. Love these for giveaways. The gifts will have a piece of my heart in it...literally! Thanks for the post!